“Product designer Kacper Hamilton came into our studio in London to talk about what makes him tick. Recognising his inspirations such as the theatre of his religious upbringing, traditional schooling at the idiosyncratic Christ's Hospital to a world where Google might provide the creative leap, he shared with us his love of stories and making products that tell these tales in new ways. For example, the port glasses from 'Bishop of Norwich' insist on being constantly passed around, they can't be put down except into their heavy brass holders. The inspiration was the 19th century signatory who was notorious for dropping off at the dinner table. In honour of the SBID international Awards Ceremony 2013 at The Dorchester Hotel, art glass specialists Vessel Gallery, have been asked to curate an exclusive exhibition of exquisite centre pieces. All artworks have been created by hand for the occasion, in an exemplary array of glass techniques by some of the best studio artists and designers currently working within the UK. Their collective achievements bring together one of the largest independent glass displays shown this year. Minarets designed by Ezgi Turksoy & Kacper Hamilton was chosen to be a part of this exhibition. 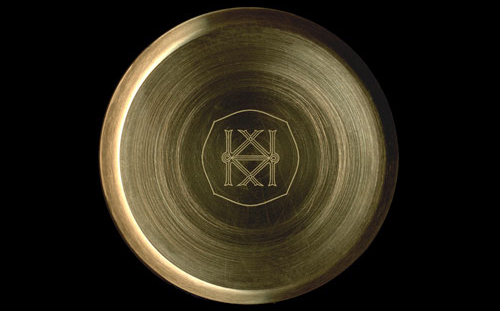 Following this exclusive launch all pieces will be exhibited at Vessel Gallery until the 31st December 2013. Sara Sensoy of BONE Magazine, Turkey has interviewed Kacper Hamilton about design, inspirations & London Design Festival 2013. "Kacper Hamilton, who participated this year's London Design Festival with his elegant creation Bishop of Norwich inspired by the traditional dining rituals, is a bold figure within the design world who has chosen to let his creativity free…"
The interview tackles the designer's inspirations, experiences & aspirations. Team Wallpaper* took to the capital's streets during the London Design Festival to bring their readers the highlights. The selection was presented as a photographic taster, which included from the finest pieces of design to the startling installations. 'Bishop of Norwich' which was released at Mint Gallery for the London Design Festival was one of Wallpaper* Magazine's favourites! We are launching our most recent work with Mint Gallery in South Kensington during London Design Festival 2013! Mint is a significant interior design store established in 1998 by Lina Kanafani. Based in central London, it is renowned for its contemporary collections and creative merchandising, offering cutting edge design cleverly mixed with innovative one off pieces. Please come and see the work between the 14th and 30th of September at Mint, 2 North Terrace, SW3 2BA. 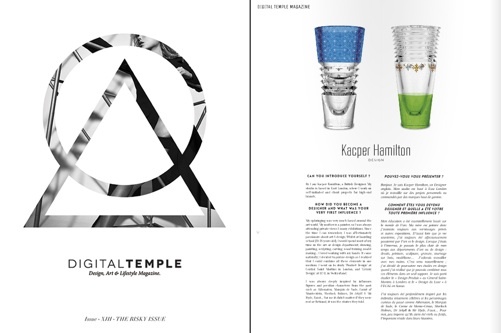 Digital Temple Magazine: THE RISKY ISSUE, features an in depth interview with KACPER HAMILTON about design, dreams, influences, and the creative process. DT / TODAY, WHAT IS YOUR STRONGEST INSPIRATION ? To read the full interview, please see here. Following the successful launch of the EXQUIS collection for Baccarat KACPER HAMILTON is releasing for the first time the video of the EXQUIS Baccarat iPad application to celebrate the significant role this experimental tool played within the creative process. EXQUIS pays homage to the great and varied history of the different decorative styles used by Baccarat crystal since their foundation in 1764. Kacper Hamilton (British Designer) and Michal Florence Schorro (Swiss Photographer) have collaborated to create this collection of three unique vases. Each vase is a ‘totem’, an emblem in celebration and respect to Baccarat’s ancestry.